Lions are the second largest cat species, behind the tiger. Lions are tawny in color with dark tufts of hair at the ends of their tails. Lions are sexually dimorphic, meaning there is a visual difference between males and females. Male lions sport a mane (a ruff of hair) around their necks and females do not. Lions are also the only social cats, living in family groups called prides. The average lifespan for a lion in the wild is 8 to 10 years. 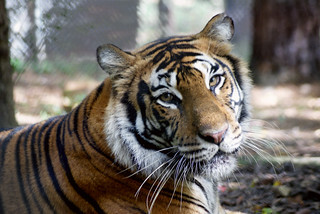 In captivity, they can live between 15 and 18 years. Male lions average between 300 and 575 pounds and females between 250 and 400 pounds. 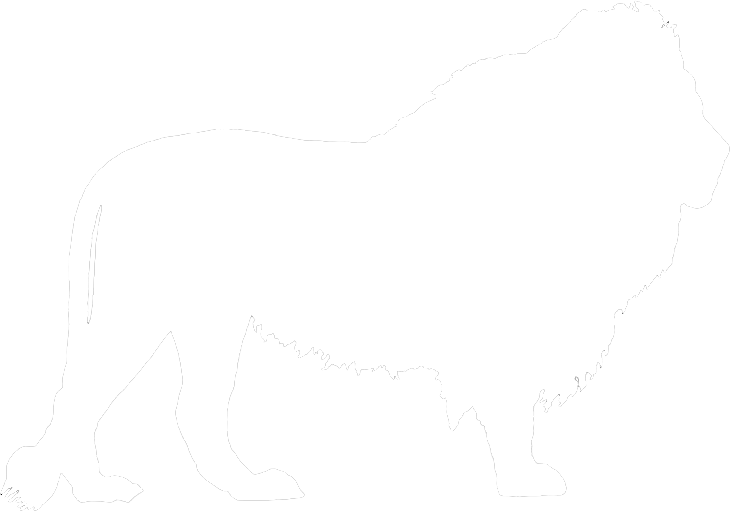 Lions have large, muscular front legs to drag down their prey. Lions use their powerful, retractable claws to grip their prey and then use their weight and strong front legs to pull the animal off its feet. Lions are a tawny or light brown color. The backs of their ears are a darker brown or black, and they are the only cats with dark tufts of hair on their tails. 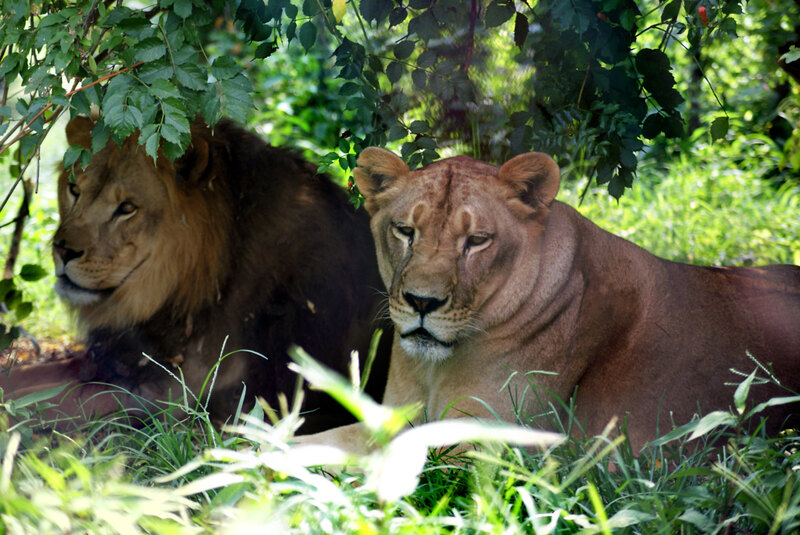 Male lion manes can range in color from blonde to dark brown and can be a variety of thicknesses. Lions are the only social cats that live in family groups. Lions have excellent eye sight and hunt mostly at night. The females do the majority of the hunting and each member of the hunting party has their own specific job. Male lions are charged with protecting their territory and will often hang back and wait for the hunting party to return. Because they are larger and bulkier, male lions are less efficient hunters than female lions. Lions live in grassy plains, the savanna, and dry, open woodlands in Africa. 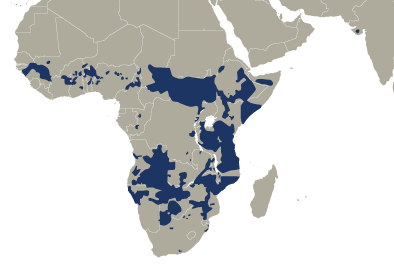 A lion pride’s territory can be anywhere from 15 to 400 square miles. Lions have long been killed as part of tribal rituals and for their supposed medicinal and magical powers; it is feared that they may replace tigers as sources of ingredients for Chinese medicines. Lions are also threatened by burgeoning human populations. As human population grows into lion habitat, lions lose their range and also become targets for poisoning and poaching by livestock ranchers. Trophy hunting is another threat to their well-being, with white lions being especially popular in canned hunting. In the wild, lions face an indirect threat from climate change called co-infection in which they acquire both canine distemper and a tick-borne parasitic disease during times of severe drought; together, the diseases cause high mortality. In 1994, the Serengeti National Park in Tanzania lost 30% of its lions within a few weeks. Such droughts are predicted to become more common. In addition to distemper, most African lions eventually acquire feline immunodeficiency virus (FIV), though they do not become sick from it. They also suffer parasitic diseases. Hyenas and leopards will kill lion cubs. Weak, sick, and wounded adult lions may be attacked by hyenas as well. Lions can be found from Sub-Saharan Africa to Northern South Africa. Lions are obligate carnivores, meaning they must eat meat to survive. Lions eat a variety of wild animals in Africa, including zebras, antelope, and gazelle. Occasionally, they will take down larger prey, such as rhinos, giraffes, and elephants. A lion’s gestation period is about 110 days. A litter will contain between two and four cubs. Lions are the only cat to live in family groups. Although there are occasional scuffles between pride members, they rarely last long. Most of the time, lions in prides can be seen showing affection for each other. All female lions in the pride help care for the cubs and males will help protect the cubs as well. Lions spend the majority of their day sleeping, hunting mostly at night. Lions are very strategic when they hunt, with all members of a hunting party having a specific role to fill. Lions are currently listed as vulnerable. They are considered a keystone species, which means that the ecosystems where they live would change drastically if lions were to go extinct. Since the killing of Cecil the Lion (by an American dentist), many people have now become aware of "canned hunting" in which lions are raised to be killed. Canned hunting is not a means of conservation.